The loss of an adult tooth can be not only physically, but psychologically detrimental to a person’s health. Tooth loss can affect chewing ability, speech pattern and self-esteem, and also lead to a host of other serious issues. When a tooth is lost due to injury, defects, disease or decay, the resultant gap can lead to many problems including the weakening of the alveolar bone that supports and surrounds teeth. This happens because the stimulation that usually comes from a tooth or teeth that are missing, no longer stimulates this bone, which over time, leads to the deterioration of the jawbone, also known as the Basal Bone. When the jawbone is not being used to anchor teeth, it becomes weak, losing its strength, firmness and ability to support other healthy teeth. Dental implants are, in most cases, the best way to treat missing teeth. Dental implants are typically made from titanium, and act as a sturdy replacement for teeth. They are shaped like the root of a tooth and will act as an artificial one as they are locked into place. Once implanted, your natural bone will anchor the implant into place by fusing, or attaching itself to the implant, thus providing a strong foundation for a happy, functioning tooth. Implants can help prevent another damaging result of tooth loss – the sinking of other teeth. When a tooth is missing for an extended period of time, other teeth will shift into that empty space. This can cause all sorts of cosmetic unpleasantness while weakening the integrity of the jawbone. Cosmetically, a missing tooth – especially a front one, can be embarrassing and lead to a lack of confidence, and departure from everyday activities. Dental implants look, feel and function as normal teeth, while helping your mouth retain its natural smile, and stimulating bone growth and strength. While dental implants can provide some relief from having to worry about cavities, proper daily oral care and maintenance are required to protect the rest of your mouth from decay or disease. 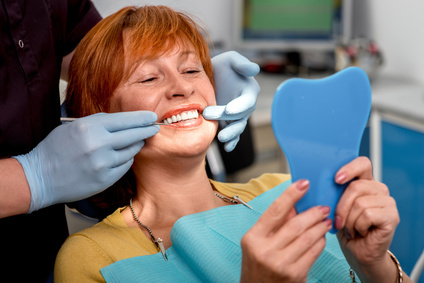 It is important to see your dentist for regular checkups as they have special instruments for cleaning implants that will not damage their metal surfaces beneath the gums. Or use the form below and we will contact you soon. *In the absence of gum disease only. Must be 21 and older. *Base price. Must be 21 and older. Call today to set up an appointment!